AdMob has published its latest set of mobile advertising metrics, which show strong growth in smartphone ad requests on its network from iPhone and Android handsets. iPhone increased its share of smartphone requests from 33% last February to 50% this February. In the same time period, Android grew from 2% to 24%. 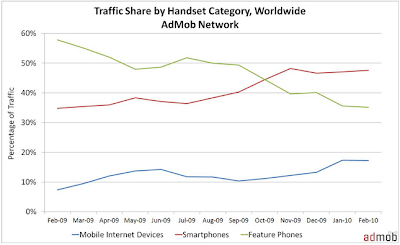 Symbian is the big loser; in February 2009 it accounted for 43% of AdMob's smartphone requests, but now it only takes 18%. More generally, smartphones accounted for 48% of AdMob's worldwide traffic last month, up from 35% in February last year. AdMob is getting plenty of ad requests from mobile internet devices though, including iPod touch, PSP and DSi. This category now accounts for 17% of the company's traffic. The full February 2010 AdMob Metrics report can be read here.